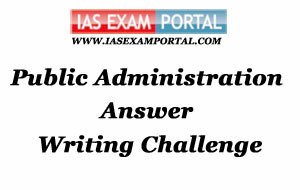 Weekly Mains Exam 2016 Answer Writing Challenge - Public Administration "MODULE- 43" | IAS EXAM PORTAL - India's Largest Community for UPSC Exam Aspirants. Weekly Mains Exam 2016 Answer Writing Challenge - Public Administration "MODULE- 43"
Public Administration- Paper I "Syllabus Topic – Administrative Thought : Human Relations School (Elton Mayo and others)"
Q1. Highlight the major conclusions of Hawthrone studies. To what extent would it be appropriate to refer Human relations school as ‘neo-classical’ ? Indian Administration- Paper II "Syllabus Topic – Union Government and Administration: Judiciary"
It was well settled that the public interest litigation could be initiated by means of letters and telegrams addressed to the Court. The letter or telegram addressed to an individual justice of the Court cannot also be rejected merely on the ground that it is not addressed to the Court. In other words a letter or telegram addressed by a public spirited citizen can legitimately be regarded as an ‘appropriate proceeding’ for the purposes of article 32 of the Constitution. The strategy of public interest litigation has been evolved by the Supreme Court with a view to bring justice within the easy reach of the poor and the disadvantaged sections of the community. The Supreme Court has expanded the wings of public interest litigation in the course of time. The instrument of public interest litigation has served to protect the human rights of poor and disadvantaged masses. It has covered several areas of litigations. The Supreme Court has used the jurisdiction for prohibition of exploitation of workmen, enforcing the rights of children employees, and release of bonded labourers. It was used for the eradication of the child prostitution, devadasi system and jogin tradition, and rescue and rehabilitation, through various welfare measures, of prostitutes and their children. The Court has used the instrument of public interest litigation for seeking relief against mala fide acts of the public servant in the discharge of his functions as public servant, protection of the environment and the people’s right to natural resources, release of undertrials on bail and to direct the speedy trial, seeking release of children below 16 years detained in jails to direct the CBI to conduct investigation as to corruption, and also for the protection of independence of the judiciary. The public interest litigation was also used by the Court to award the monetary compensation in appropriate cases of violations of right to life personal liberties. The award of compensation in public interest litigation proceeding is the admirable and pleasant idea of justicing the poor and disabled victims of violations of right to life personal liberties.